Posted January 20th, 2019 by Mike Boyes & filed under Aggression, Attitude Formation Change, Child Development, Consciousness, Early Social and Emotional development, Intervention: Adults-Couples, Intervention: Children Adolescents, Intervention: Identifying Key Elements of Change, Learning, Legal Ethical Issues, Social Influence, Social Psychology, Stereotype Prejudice Discrimination. Description: Have you seen the ad recently produced by the Gillette company? Their company tag line is “The Best a Man can Get” and in their ad they argue against toxic masculinity and that recent social change movements such as #MeToo have initiated changes in our thinking about masculinity. Gillette’s ad states that things have changed, and we cannot go back. There has been quite a storm of reaction to the Gillette ad. In the midst of that the American Psychological Association (APA) released a new set of guidelines for how clinical Psychologists should approach the concept of masculinity in their clinical practices. 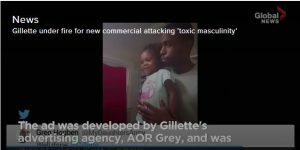 Following the release of the guidelines APA dove right into the social media water with Gillette with a tweet linked back to an article on their website talking about the guidelines that stated “more than 40 years of research showing that traditional masculinity is psychologically harmful and that socializing boys to suppress their emotions causes damage.” So, what do you think? Watch the Gillette video linked below and then read one or both the news/opinion articles that speak about the video and about the APA’s new guidelines. The APA guidelines and their article talking about them are linked in the References section below). Source: In the #MeToo age, APA has new guidelines for psychologists talking about traditional masculinity, Annees Benferhat and Saumya Dave, ABC News. Or In search of non-Toxic Manhood, Ross Douthat, The New York Times. The #MeToo movement is part of (and perhaps the catalyst that is driving) a general evaluation of a range of issues tied to masculinity and including, but not limited to, gender relations, workplace civility, equal pay, and male privilege. Thinking and talking about how we are dealing with masculinity at the individual, organizational, social and cultural levels has ramped up. Before Gillette put their video out there were others. David Schwimmer (of Friends fame) produced a series of videos showing examples of sexual harassment behavior (links to these are below) that also generated a lot of discussion. As we struggle to define and live a non-toxic version of masculinity it is worth noting that while this plays out at the individual level the issues are historically and culturally grounded and so what we are talking about and working on changing are some fairly deeply based meaning structures that are reflected in the actions of individuals. Talking about them is a critical part of managing the necessary changes that are underway. Is the concept of masculinity inherently toxic? Given that this issue is grounded in sociocultural norms and practices how do we as individuals (and as Psychologists) understand and deal with (come to terms with) the need for changes in our concepts of the nature of masculinity?